Well today turned out a little bit different than we thought.. Not a big day but a Louisiana tornado day for us regardless. We started the day in Shreveport but saw a cell that started to look good south of us. We drove down 49 and watched a cell try to organize eventually it did and produced what turned out to be a good tornado on an otherwise disappointing day. We tried TX and later towards Monroe but this day was done. All we have is the below photo and we are saddened by the losses of life in texas. This was a very difficult chase in East TX for us. I’m not just saying that because of the trees, storm mode, and speed. More on that latter. My chase partner @Chadwick Stelzl and I left DFW at 7:30 AM with an initial target of Palestine TX. We made it to Palestine and there was an impressive storm about 80 miles to our southwest in Hearne. There also was a much smaller cell to our southeast. The storm in Hearne would become tornado warned (and later would impact Franklin), but we where reluctant to go that far to a storm that was on the end of squall line, when we had a discrete cell much closer that was well separated from the line and out in front in the warm sector. So we headed south to Crockett with a plan to make a decision there. 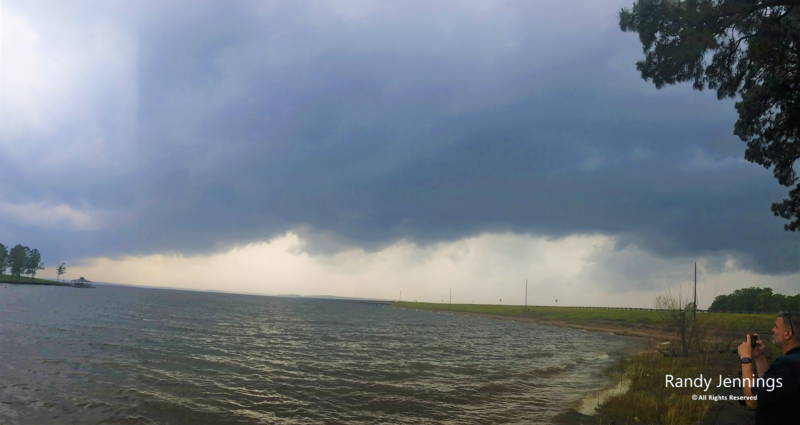 By the time we got to Crockett, the storm that was to our southeast was much more impressive and became tornado warned. We took TX 21 northeast out of Crockett with the plan to catch up to the storm, drive slow, and let the circulation cross the road and then proceed into the right flank. We passed the Caddo Mounds historic site which was packed. It was obvious that there was an event going on. We talked about what a bad day it was for folks to be at a place like that. We came into Alto and TX 21 was blocked with large downed trees and power lines. We sent reports to NWS Shreveport, who rewteeted my picture of the blocked road. While the trees took a beating in this area, the damage to structures we could see seemed fairly light – some siding ripped off a house, a metal skirt ripped off a mobile home. We didn’t see any structures that looked unsafe and didn’t see any one who needed help. Police began to arrive on scene from the other side. We attempted to get out of Alto to stay on the storm, but we tried 4 roads and everyone was blocked by downed trees. By this time we noticed another storm on radar to our southwest near Lovelady that had become tornado warned and was tracking toward Alto, so we headed back southwest on TX 21 with a plan to cut in front of the new storm’s front flank by going south down FM 227 to Ratcliff. We passed the Caddo Mounds again. I got an uneasy feeling, and was worried about the folks there. They had a person on a golf cart going around the trail, and I assumed it was to tell the folks to get into the visitor’s center. We went south on FM 227. At FM 227 and 1170, we crossed the damage path where a crew had just finished clearing from the road. We got to Ratcliff and went southwest on TX 7. West of Kennard, we came across a TXDOT crew who was removing a large tree from the road and it was down to one way traffic with flaggers. We stopped just past this and watched the new storm for a while. We decided it would be safer to be on the other side of the down tree, so we turned around and went back. We warned the crew another storm was on the way. We stopped in Kennard and tried to watch the storm, but couldn’t see the base for the trees. We went northeast up TX 7 and stopped in a clearing and watched some more. At one point we felt like it was likely on the ground, but we couldn’t tell because of the trees. We went back north up FM 227 to where the crew had been clearing the road earlier. We felt like it was still likely on the ground, but still could not tell. This was about the time the tornado was going thru the Caddo Mounds a few miles to our north. Not knowing the storm had hit anything and knowing that roads out of Alto where blocked, we turned around and we back to TX 7 and took 103 into Lufkin. We would latter learn that numerous people had been injured, some seriously, at Caddo Mounds. It will be interesting to see the storm surveys on this one, as the second storm tracked right towards Alto also. I don’t know if the major damage we are seeing on the news in Alto is from the second storm or the first and we just didn’t see it. We stopped to get gas in Lufkin and tried to beat the squall line out of town. We didn’t. It was a rough go for a while, but we finally got out ahead and crossed over the Toledo Bend Reservoir into LA before calling the chase in Many, LA. We let the now weaken southern end of the squall line overtake us before heading home. Here is a picture as the squall line crossed over into LA. 645 miles and 14 hours after we started we made it home. This was a tough chase emotionally. It is hard to pass so many people either blissfully unaware of the serious weather approaching or thinking it will not impact them. It is hard to think of that family that was north of Lufkin that had a tree fall on their car and kill 2 kids. Where they aware and trying to escape the storm? Navigating around these storms in the trees was tricky even for a couple of seasoned chasers with lots of knowledge and radar. I can’t imagine how an average person would do it. You second guess yourself about should you have done something differently. Should we have stopped at Caddo Mounds to warn them? If we did would it have put them in even more danger if they all got in cars and started driving? Would any one listen if we did? Outside of the damage reports, I think we made one rotating wall cloud and one possible tornado report to the NWS. I hope the reports made at least a small positive difference. The lack of a good spring storm season so far in the Midwest prompted me to make this trip for a setup I would normally not think of chasing. My main goal for this trip was not tornadoes, but to capture high-speed video of lightning that I expected to be in plentiful supply as it typically is with these types of systems. I chose to intercept storms as they moved into better visibility/terrain along and west of the Mississippi River, as the trees and terrain west of the river bottom is virtually unchaseable. The first two elevated storms I encountered north of Tallulah, LA were virtually visible-lightning-free. 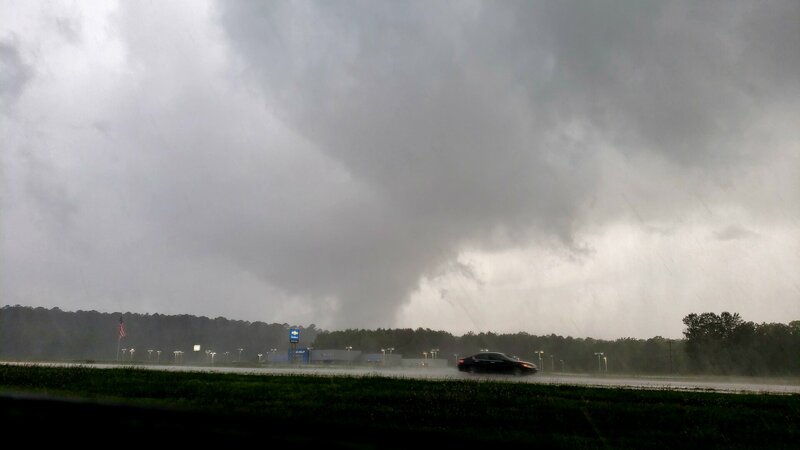 I drove through the small town of Forest, LA in this area, encountering fresh damage that appeared tornadic (large trees uprooted with trees falling northward in town and southward west of town) from one of these supposedly elevated storms. I found the lightning I was looking for with the tornadic storm moving through Vicksburg. I tried to catch a glimpse of the circulation crossing I-20, carefully inching eastward monitoring the wind direction to discern what was ahead. I could not see anything. After getting head of the storm east of Vicksburg, I got my opportunity to shoot a high-quality lightning barrage with brilliant stepped leaders captured on several cloud-to-ground strokes. I re-intercepted the storm on I-55 north of Jackson, catching a couple more bolts before the storm swept over the road. There were no good roads available to get ahead of the storms again, so I called it a chase at dusk and headed home. I hate I missed you Dan, I would of relished an opportunity to shake your hand, hopefully to gain some knowledge by osmosis. Drove 917 miles one way from Eastern NC to my target of Tallulah LA and arrived at 10:30 am and nervously napped waking up about every 15 minutes and checking radar, waiting on storms. Drove North into the Delta to have a clear look at storms, but nothing was exciting and I got antsy. Drove North up 65 to Lake Providence to chase a nice Mezzo there. 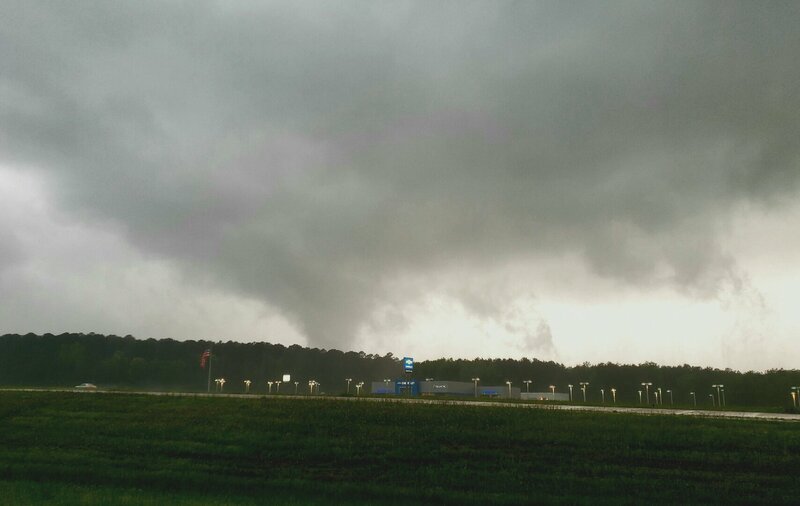 Ended up seeing the confirmed tornado south of Tallulah, so we dropped South driving through another circulation back to Tallulah and ended up on 20 right behind the tornado. Could see NOTHING except small debris and rain curtians ripping south when we would get too close. Chased up 61 into Vicksburg and broke off chase when we got worried about getting stranded there because of potential problems on 20. Ended up in Tuscaloosa about a mile from the tornado there later. I've been chasing NC, SC and VA for 3 years now exclusively so I'm used to HP and trees. Don't know why I was expecting a good look at these storms but I made the drive anyway. I would post videos but I mean, it's all rain and falling limb/leaves. I was just happy to go to a "travelling" event and get my forecast/target area right, and not have to run across injuries or loss of life. Thanks to everyone here for their reports and discussion prior to the event. Here is another shot of the Stonewall tornado. This sucker sure made me think a big day was in store for LA but it just could not recover.